Tsumeb Backpackers & Safaris is a small Backpackers with a vibrant vibe. We are your perfect stop over for Etosha National Park and the Caprivi. 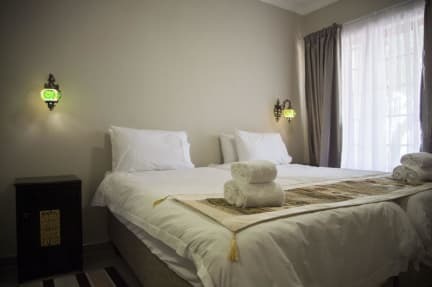 Our beds are fitted with luxury linen, ceiling fan or air conditioning. We are close to shops, banks, Museum, etc. Tsumeb Backpackers & Safaris is only 120 km away from Etosha National Park. And 60 km from the Hoba Meteorite near Grootfontein. We are very close to our beautiful golf course. We have a local bar around the corner from us. We offer an all year around splash pool to relax. Our rooms is fitted with ceiling fans, air conditioning, Luxury linen, feather down and towels. 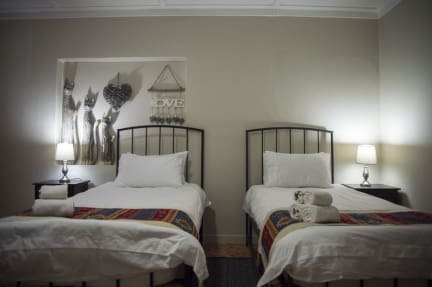 All rooms have bed lamps for reading at night. We have a television Room with a big TV for movie Time. We offer DSTV to our guests. Free inside parking if available and Free Wi-Fi. We also offer to pick up guests at the bus stop at night times. Please request before hand. Reception is open 08:00 - 17:00. The perfect atmosphere to stay for as much as you can. Cleanliness that i have never seen again and an amazing breakfast. They also make tours to Etosha National Park which was probably the best way to see Etosha, driving all day with a local telling you everything about all animals. Great hostel with incredibly well designed interior. Very comfy and friendly staff. A 10 - 15 minute hike into town. Would definitely come back. It is like 5 star hotel at hostel price.